Image 1 of 10. Click to view fullscreen. A mix of the modern and traditional The Tractor Shed seamlessly blends wood and glass to make a truly unique space. Floor to ceiling windows allow you to take in an untouched world outside for an enviably romantic setting. A handmade English ash kitchen is the perfect place to cook a meal together with all modern appliances for ease. The Tractor Shed also boasts a hidden secret, a snug cosied up a wooden ladder ideal to read a book or have an afternoon nap. The living space is spacious and welcoming with an open plan feel allowing the property to flow from eating and dining to relaxation. Also on the ground floor is a beautiful king size bedroom perfect for two; with the signature floor to ceiling windows to watch the world go by. An immaculately finished ensuite completes the picture with your very own rain shower. For balmy evenings there's a patio to either eat outside, when the weather permits, or star gaze on clear nights. For those with four legged friends dog bowls and leads are provided so your canine companion can enjoy a break too! To make your stay extra special St Kitts toiletries are provided and catering can be arranged on request so leave the cooking to someone else. 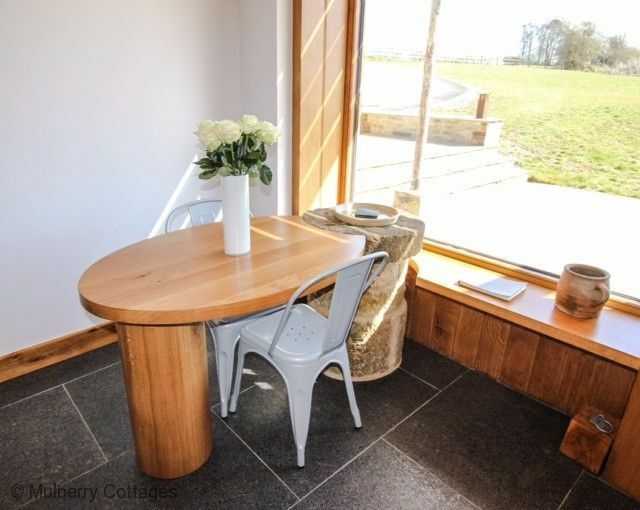 The Tractor Shed is perfect for a relaxing break in unspoiled surroundings. Wi-Fi Eco heating and ventilation Two pets welcome a lead and bowel are provided. A pet fee of £30 is applicable per week, per pet. At an extra cost we can arrange extra housekeeping, veg boxes, catering, and homemade meals to be left in the fridge Parking for multiple cars The properties master bedroom is on the ground floor but access to the snug is via a wooden ladder, children would need to be supervised and it is not accessible for those with mobility issues. The famous Soho Farmhouse is a short walk from The Tractor Shed if you are a member. Also why not try the local golf course or the pub The Falkland Arms for a spot of lunch. A 10 minute drive to Blenheim Palace and 15 minute drive to shopping at Bicester Village.